Yes, we are the pefect party option for your group! You can select the featured artwork from our gallery of over 6,000 paintings. 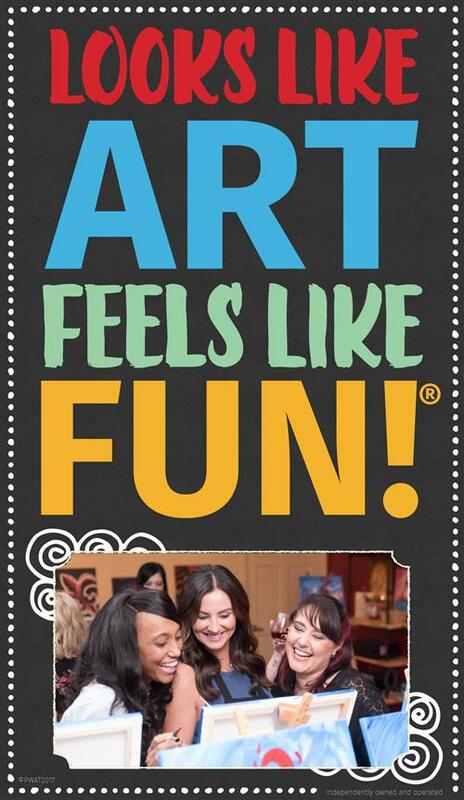 You get a private party room and your own artist-instructor to provide step by step instruction. Your party can be as over the top or as understated as you'd like. Hire a caterer or decorator...the possibilities are endless. You don't set up or clean up... you just show up! You get the room an extra hour besides class time to decorate, mingle and celebrate – free of charge. You pay the same price per person as our regular public class! 7 days of the week and you name the time (12:00 p.m. -10:00 p.m.), subject to artist availability. Family parties with children between the ages of 7 and 15 may be scheduled during the daytime or early afternoon. How to Schedule a Private Party? Our calendar often shows when the private studio is booked, but often times there are events planned not showing on the calendar. Please email us at studio118@paintingwithatwist.com or call us at (703)687-4604 with your selected date/time and we'll confirm if your party time is available. You can also complete a party request at: https://www.paintingwithatwist.com/ashburn/request-party/. To reserve your selected date/time, you must sign and return the Private Party Contract. In addition, a valid credit card is required. Your individual reservation will be charged to verify the credit card when you return your contract. Once you have chosen your date and secured it with the signed contract and initial reservation payment, your event will appear on our calendar. There is a TWO WEEK cancellation policy. A $200.00 cancellation fee will be charged if less than TWO WEEKS notice of cancellation is given for a private event. The private party minimum is 10 people. If the party minimum is not met, the credit card on hold will be charged for the difference. For example, if only 8 people attend the party, the card will be charged for 2 additional people to meet the minimum requirement. We can accommodate up to 14 guests in our smaller studio and up to 32 guests in our larger studio. The class will begin promptly at the scheduled time. Painting With a Twist will provide everything needed for the session including easels, canvases, paint, brushes and aprons! Guests may bring their own snacks/appetizers and favorite beverage including soft drinks, wine or beer (no hard liquor), per VA ABC. We do not provide ice or have a refrigerator to store party items, so you can always bring your own cooler. How soon should I schedule my party? The sooner, the better! Private event dates book very early! Once your private event is booked, you will be granted access to view our gallery of beautiful artwork! It is a blast to search for just the right painting for your group! Don’t have the minimum number of people to have a private party? No problem! Sign up your small group in a regular/public class. Let us know and we will set up a VIP section for your group. No contract required. However, you will not be able to bring in your own alcoholic beverages for a regular class, per VA ABC. Art must be selected from the PWAT Kid’s 1.5hr category. Minimum age is 7 to paint. $400 for 10 painters plus the birthday child. $500 for 10 painters plus the birthday child. We look forward to celebrating with you!! :) Please email us at studio118@paintingwithatwist.com or call us at (703)687-4604 to reserve your spot today. You can also complete a party request at: https://www.paintingwithatwist.com/ashburn/request-party/.